As I said before in my other post about my box swap #3 I would do some posts about the makeup I received from my sister, so I'm going to do this one about some of the lip makeup I got and the 3 blushes she sent me. My sister knows how much pink colours suit me so she mostly sent me pink makeup haha, anyways I like the light shades of pink because I feel they make my makeup look very natural and I don't look like I am wearing makeup so first up I will talk about the 3 blushes. 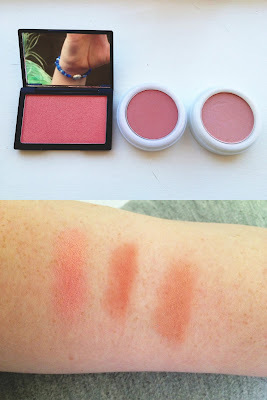 Two of them are from natural collections and other is a sleek cream blush (which is gorgeous) Out of the two natural collection blushes I say I prefer the shade peach melba as it is a more subtle colour and blends in better, where as dusty pink looks better as an eye shadow. The Sleek blush is my favourite out of all 3 because it's a cream and it blends in easily and when you build up the colour on your cheeks it still looks natural and not a bright ugly pink, it has a nice gold tint to it which glistens in the sun light (making you look like you belong in twilight! ok I am joking) But I really do recommend all 3 of these blushes. Lip colours!! 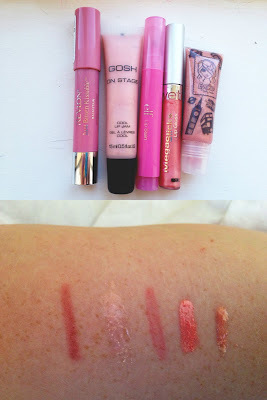 Now i really like lip stains and lip glosses a bit more than I love lipstick, my sister sent me quite a few of them in the beauty box and I did some swatches on 5 of them, which are Revlon just bitten kissable balm stain, Gosh on stage cool lip jam, Elf lip stain pink petal, wetnwild mega sticks lip gloss and Eyeko pretty London portobello. I will just cut to the chase I didn't like the Eyeko lip gloss and wetnwild lip gloss as much as I liked Gosh, my reason being is I found it it came off too fast (eyeko) and the wetnwild lipgloss smells horrid, where as the other too felt nicer and lasted longer on my lips. Out of the 5 of these, my favourite products were the lip stains, they last for ages and look great and when they fade they still look nice. I don't think a darker shade lip stain would suit me so much, not as much as a dark lipstick does.